OpKey Execution Agent is a Functional Test Execution Engine which provides a GUI-based execution environment on the web. It follows the Open Test Architecture design by supporting the execution with any new plug-in. OpKey Execution Agent is necessary for executing Test on desktop and web using OpKey. So, make sure that it is installed on your machine with required configurations and is working properly. Now, OpKey Execution Agent is also available as standalone installer. It can be used for Test Execution on both OpKey Desktop and OpKey Web. 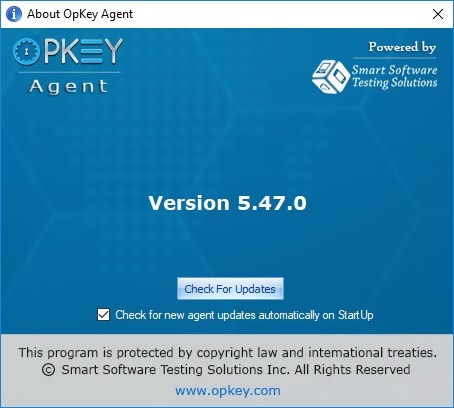 The main objective of developing this standalone OpKey Execution Agent installer is to run the execution on OpKey Web by using this Execution Agent. In fact, both Execution Agents (standalone OpKey Execution Agent & OpKey Execution Agent installed with OpKey desktop package installer) are the same. Agent Information page opens. Here, you can view your Domain Name, Username, Agent Version, Agent Authentication Code along with Download Agent Link. 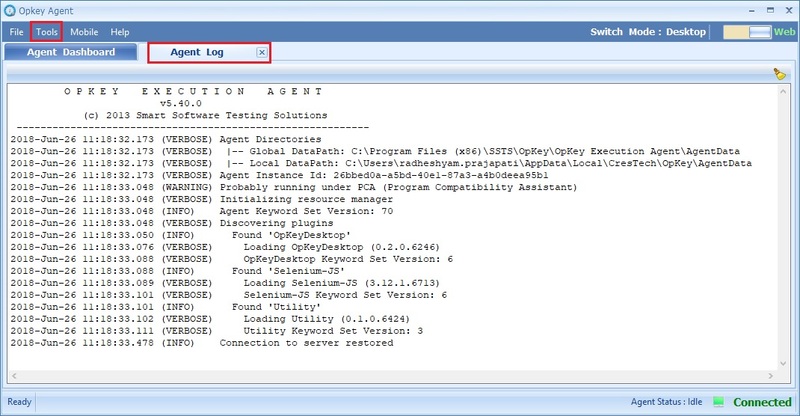 Click on the Download Agent link to download the OpKey Execution Agent. Initiate installation of OpKey Agent on your machine. 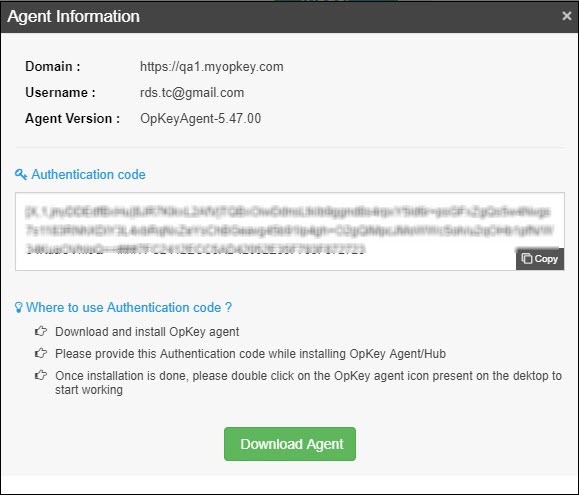 While installing OpKey Agent in Web mode, you need to enter the Agent Authentication code and then proceed the Agent installation. Now, there is a Authentication code (an unique alphanumeric) available on the Download Agent page under Download Center. This Authentication code is required during installation of OpKey Execution Agent in Web Mode (by default), you will need to enter this Agent Authentication code to specified text field and click on Finish. Once installation has finished successfully, a shortcut icon of OpKey Agent is created on the desktop. Double click this shortcut icon to launch the OpKey Agent. Here, you can view that your OpKey Agent is configured successfully in Web Mode and you are logged in. Thus, you need not to configure the OpKey Agent manually. Once, OpKey Execution Agent get installed on your machine successfully, an icon is shown on desktop. When you launch it, Agent Dashboard page opens as shown below. 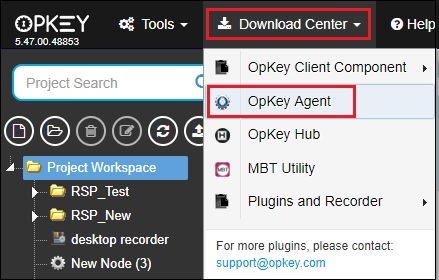 Agent dashboard page contains information about the Settings, Configurations & Plugin License of OpKey Agent. File: File menu contains two options: Relaunch & Exit. Relaunch is used to to launch Execution Agent to apply any newly made changes whereas Exit is used to close the Execution Agent. 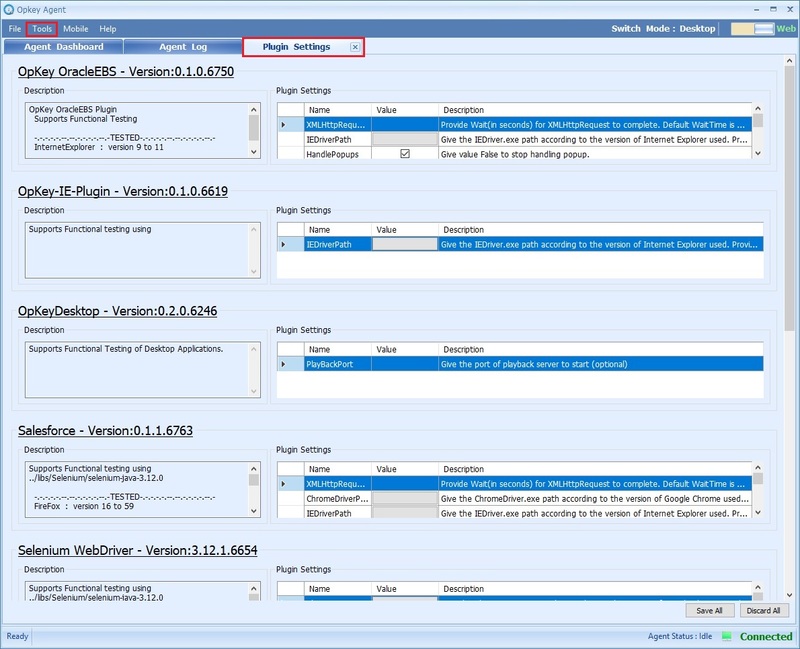 Tools: Tools menu contains two options: Agent Log and Plugin Settings. Plugin Settings option displays list of all OpKey Plugins along with description and settings as shown below. 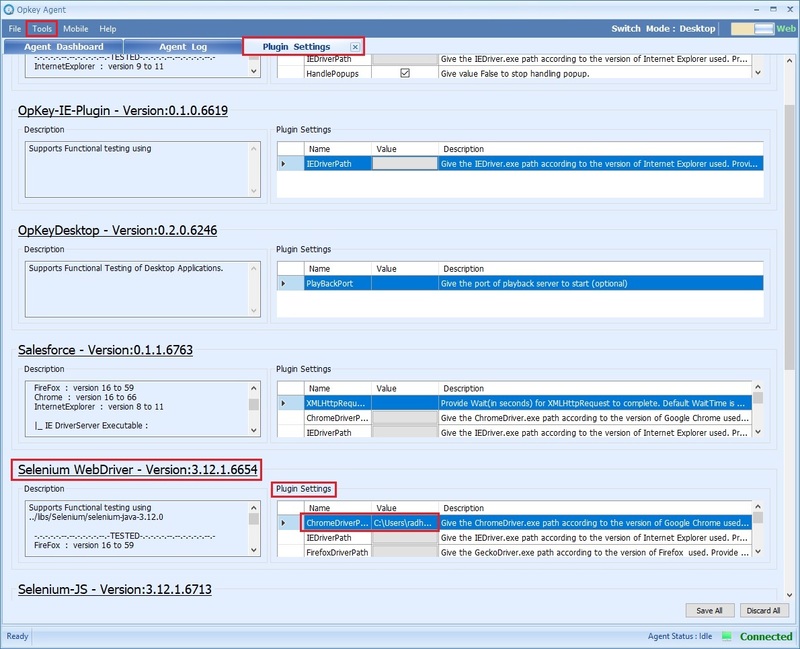 Plugin Settings help you to execute Plugin specific Test by using respective plugin driver. 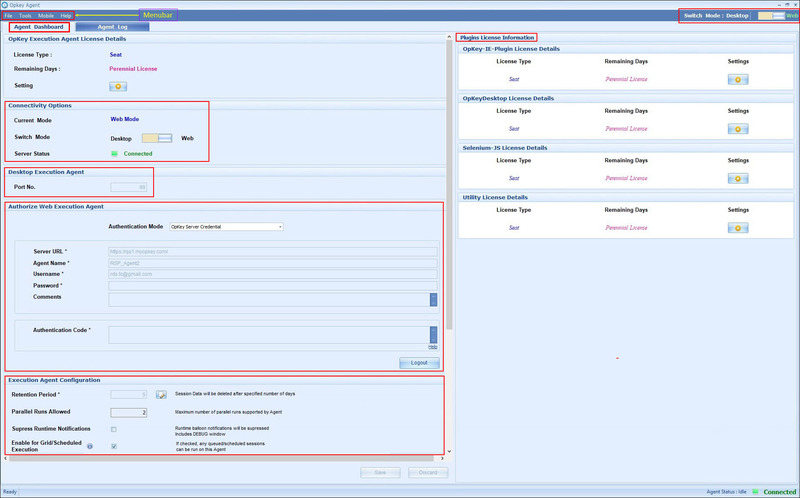 Mobile: Mobile menu opens a Mobile tab which includes information (OS, Device Name, Serial Number, Manufacturer, Build Model, Version, IP Address, Duration & Status) about the connected mobile device and Device Logs. Help: Help menu includes two options: Go To Help (F1) and About OpKey Agent. Click on Go To Help or press F1 key to go to the Online Help of OpKey Execution Agent. Click on About OpKey Agent to view its version and check for available updates as well. The configuration of Execution Agent is required for Test Execution on OpKey Web & Desktop both. At a time, you can configure the OpKey Execution Agent either for OpKey Desktop or OpKey Web. There are four default plugins which get installed automatically with the OpKey Agent & they are OpKey-IE, OpKey Desktop, Web & Utility Plugin with 30 days of trail period. You can also extend and avail license by contacting to OpKey Support team.